You might wonder why a weekend getaway to the Santa Cruz area would appear in a blog entitled, "This is Why Merced", but one of the very cool things about Merced's location for us Minnesota natives unfamiliar with California is its proximity to so many great places to visit. It's been said that Merced is in the middle of nowhere, but a 2-hour drive from everywhere, and that adage seems to hold true. In just over two hours on a recent Friday morning, Sean and the huskies and I made it to the coast for a 4-day beach getaway to celebrate Sean's 40th birthday. We rented The Surf House from some wonderful people who welcomed us and the dogs into their beautiful rental near a dog-friendly beach. They thought of all the details, including a well-stocked kitchen, plenty of beach towels, chairs, and umbrellas, and a comfy, clean restored house that felt like home for 4 days. The view from the front window of our rental. Rio del Mar State Beach was right across the street and down a few steps. 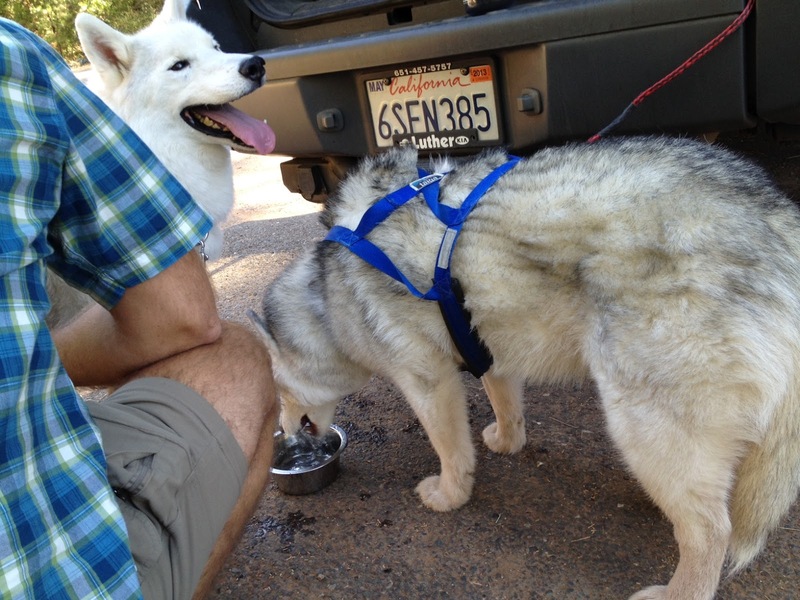 Kodi got a little tired walking in the sand so he got a lift from Sean back up the hill to The Surf House. Friday's weather was a little cloudy, but still quite nice. There were some fantastic sandwiches to be found right around the corner from our rental home at the Pixie Deli and we almost had the place to ourselves because it was a Friday afternoon. With our bellies full, we checked out the beach with Ili (including the SS Palo Alto), grabbed some snacks at the grocery store in Aptos, relaxed with books, and ate a delicious seafood dinner just steps from our rental at Cafe Rio, which was recommended by a colleague who used to work at UC Santa Cruz. The old cement ship, SS Palo Alto. Saturday was gorgeous and sunny and we started the day with strawberry/Nutella crepes at Sweet Pea's Cafe in Capitola. Then we walked down to the water to check out the surfers. Afterward we headed back to the house to pack up the huskies and supplies for a morning at the beach. Waiting for the right wave. Our beach set-up for the morning. Umbrella shade for the huskies. The life of a California pup. The boys, napping at the beach. After the beach we let the huskies rest at home while we headed to Henry Cowell Redwoods State Park and hiked the Redwood Grove loop. These trees are not quite as big at the sequoias in Yosemite, but they were impressive nonetheless. After the park we drove through UC Santa Cruz's beautiful campus and headed downtown for some delicious homemade ginger pear ice cream at the Penny Ice Creamery. Dinner brought us to Cafe Cruz in Soquel, where the food was good and the atmosphere was even better as we were seated outside on the patio next to the fireplace. It was so refreshing to be chilly out of doors after so many months of high temperatures in the 90s! On Sunday we tried Belgian waffles at The Hole in the Wall Cafe in Aptos (not so great) and enjoyed more time at the beach with my friend Anna and her family. Anna has a similar job to mine at UC Santa Cruz so we work together on UC-wide projects. She and her husband are originally from Siberia, so she's one of the only people I have met since moving to California who, when hearing I'm from Minnesota, didn't say, "Oh, I heard it's really cold there." The three year old twins had a great time searching the beach for treasures, including the carcass of a duck. Sean helping Kodi walk on the beach, and Daniel and Nina helping each other. We couldn't resist another great California club sandwich at Pixie's for lunch. Afterward our friends headed home for 2:00 nap time and Sean and I headed to the Santa Cruz wharf. 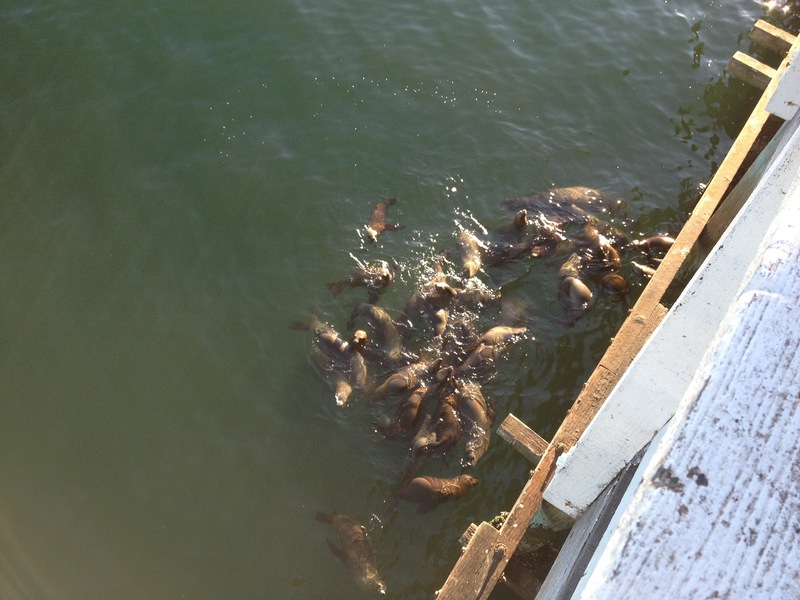 Sea lions resting below the wharf restaurants. Viewing platforms are provided for human gawkers. 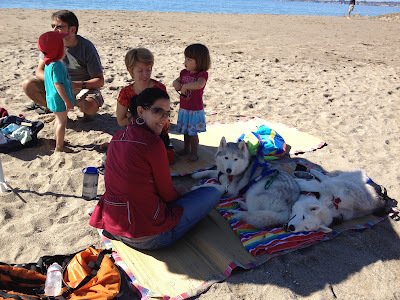 We headed back to the beach house in plenty of time to bring the huskies to the beach to view our final sunset. The house and Rio del Mar beach are perfectly positioned to view the sunset over Capitola and each night was a different, beautiful show. The first night was cloudy and very pink. The second night was clear and bright. The final night was the most beautiful of all with shades of pink and orange and lavender off in the distance. Pointed west and waiting for the show to begin. But the show kept getting better. Monday morning brought us back to Sweet Pea's in Capitola for those delicious crepes with a stop at Whole Foods for some seafood and other goodies to take home to the valley. The fog rolled in, so we decided it was time for us to roll out. What a fabulous visit to the coast! Foggy view from The Surf House on Monday morning. 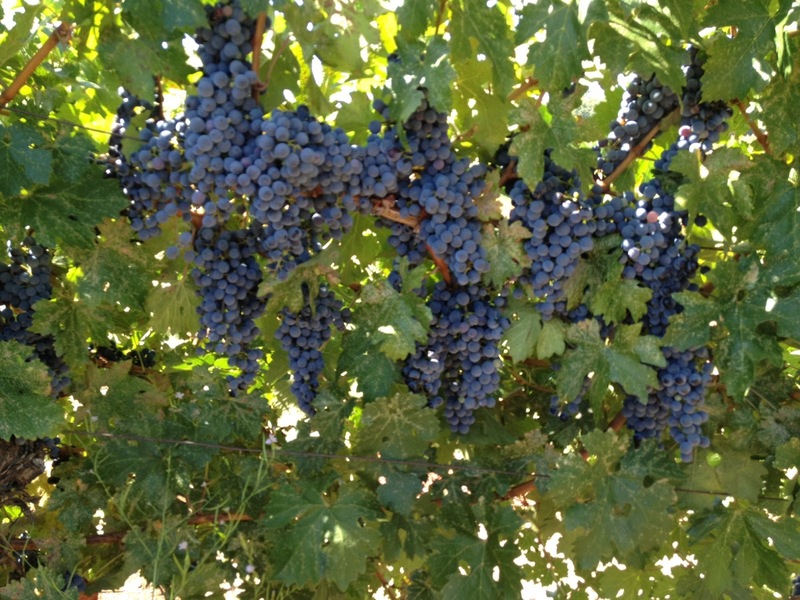 Given the Mediterranean-like climate of California, it's no surprise that Italians settled in the state and, thankfully, some of them chose to live and farm in the San Joaquin Valley. There are many kind farmers at the Merced Farmers' Market, and much delicious produce. One of my favorite stands is that of Marchini Farms. Their sweet corn is always delicious; the mini bell peppers they sell on Wednesday mornings are amazing; and their San Marzano tomatoes will help me stock the freezer with summer bounty in anticipation of colder days. I am a big fan of The Splendid Table on NPR (it doesn't hurt that Lynne Rossetto Kasper works at MPR in St. Paul) and listen to the podcast each week. Often I bookmark interesting recipes and the oven candied summer tomato recipe is a favorite. I made it often in Minnesota with tomatoes from the St. Paul Farmers' Market. Tasting those sweet summer tomatoes in the middle of winter was a special treat. I decided to try it with the San Marzanos from Marchini Farms this year. The recipe begins with slicing the tomatoes in half. These tomatoes were pretty big, so I cut them in half again. They're done with some are browned on the edges. Sort of disappointing that all those tomatoes yielded only 3 small jars of roasted tomatoes, but they will be such a treat during the dreary, rainy days of "winter" in the San Joaquin Valley. I really shouldn't complain about the sunny weather around here, but as a child of the Midwest there are certain things I miss. I miss a good thunderstorm, weather extremes, and I really miss autumn. Leaves around here just shrivel up and fall off eventually after they can't stand the dryness anymore, so I'm not expecting any sort of lovely fall foliage, but I did find out about an apple growing area near where gold was originally discovered in 1849, bringing a rush of 49ers to California. Placerville, CA and the Apple Hill area provide a semblance of autumn due to the prevalence of apple and pear orchards situated in the Sierra foothills. We decided to take a couple of days and explore the area. After driving north on 99 to Sacramento and heading east on 50 toward Lake Tahoe, our first stop when we got to Placerville was the historic downtown. There were cute shops, tacky shops, and people dressed in period gold rush costumes (which led to a discussion of whether they just dress like that in general and hang out in downtown Placerville so as not to appear too strange or whether they are some sort of volunteer or paid re-enactors.) 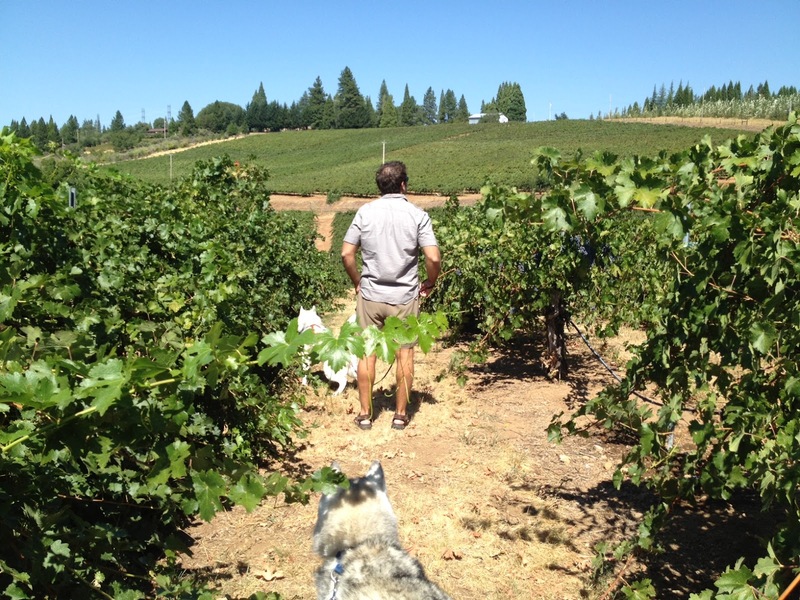 It was much too hot to leave the huskies in the car, though, so we headed to Carson Road, the start of the Apple Hill area. 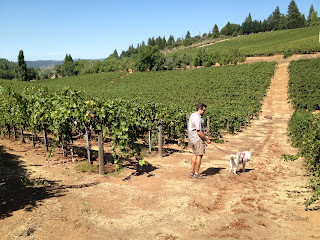 The first Apple Hill merchant we visited was Boeger Winery which offered lovely, shaded picnic tables and welcomed dogs. 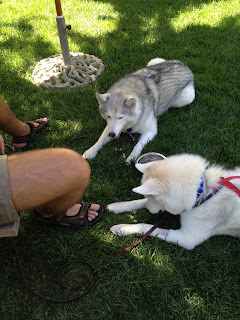 Sean and the huskies hung out in the shade and I acted as runner, bringing each of the 6 tastings Sean and I sampled, as well as a complimentary snack for the pups. 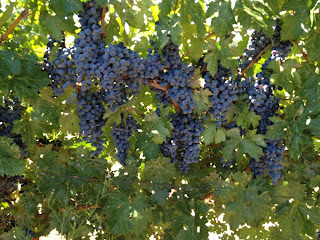 We particularly enjoyed their Pinot Gris and Tempranillo. I also sampled some figs right off the tree. 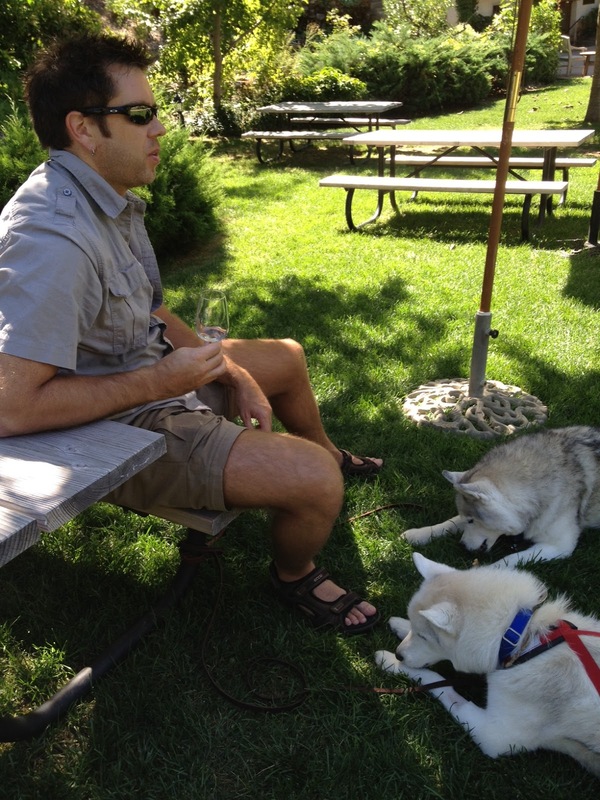 Munching the free doggie treat from the winery staff. Sampling the Pinot Gris in the shade. Next stop was Abel's Apple Orchard, but it was basically a disappointment. Stalls of crafts and too sweet apple crisp along with the saddest turkey sandwich Sean has ever seen (but which the huskies rather enjoyed - they're not picky). Instead of sticking around we decided to try another winery, since they rarely disappoint. 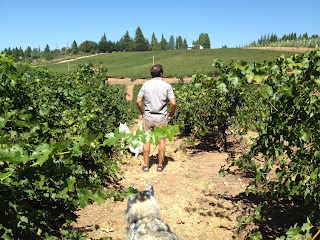 On to Lava Cap, where we enjoyed the Muscat Canelli and they welcomed the dogs for a walk up and down between the vines. Sniffing around and watching out for prickers in the paws! Lovely views in the Sierra foothills. Finally we headed to Dedrick's Cheese in downtown Placerville which was even better than expected from a pre-trip visit to their website. We tasted cheeses and salami and walked out with a bag full of delicious goodies. Back at the hotel we opened a bottle from Lava Cap, chilled in the ice bucket, and dined on yummy cheeses, La Brea Bakery bread, olives, Marcona almonds, and lime cookies for dessert. The only sad thing about the feast was that it left us too full for dinner out, as I had been looking forward to trying a restaurant in town. 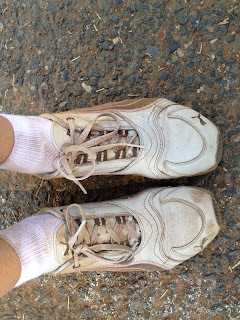 Day two began with a hike on the Fleming Trail System in El Dorado National Forest. There is a lovely lake and nice trail system that we shared with mountain bikers and horses. The huskies were pretty excited to meet the horses. Kodi marched down the trail as if he had no idea he's approaching 14 and just finished 6 months of chemotherapy. It was lovely, but dusty! Since we had a cooler full of ice only partially filled with cheese and salami, we decided to make two more stops in Apple Hill on our way home. 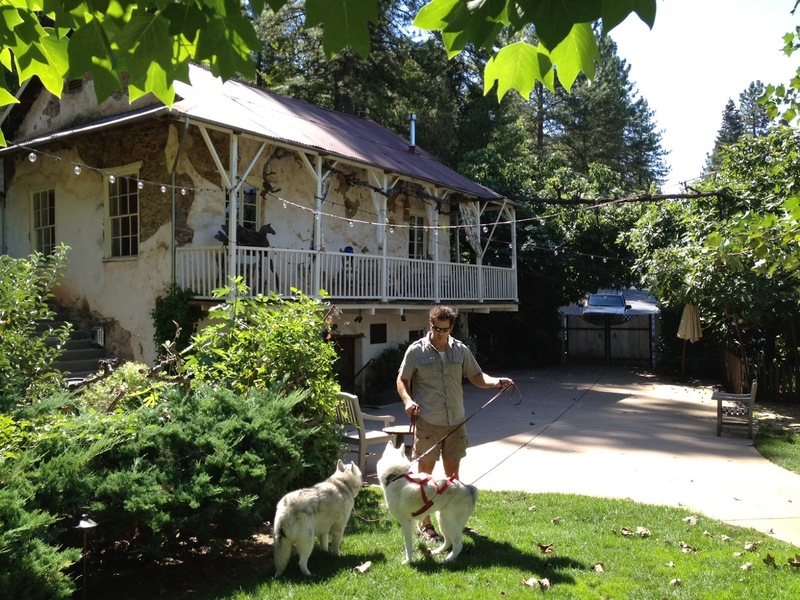 The first was Willow Pond Organic Farm where we met some nice folks and bought delicious plums, pears, and eggs. Then we stopped at Smokey Ridge Farm and Charcuterie for homemade sausages (both apple and jerk chicken varieties) and some delicious apples. It's still early in the season for many varieties, but I purchased a bag of Winter Banana apples, which I had never tasted before. They were a pleasant, sweet surprise and I will enjoy snacking on them in my lunch all week as a reminder of our fun weekend in Placerville and Apple Hill. Canning in Minnesota provided loads of opportunities, and in the Midwest, if you want to eat locally all year round, it plays an important role in the process. I also froze a lot of stuff, but we left the deep freeze with Sean's brother, so it's not much of an option these days. Plus things grow here year-round so eating locally is really quite easy. One could get lazy about canning, but luckily I enjoy it too much to give it up. A selection of this year's canned delicacies. I use many sources for recipes, but am particularly fond of my first canning book, which I received from my mom as a gift. 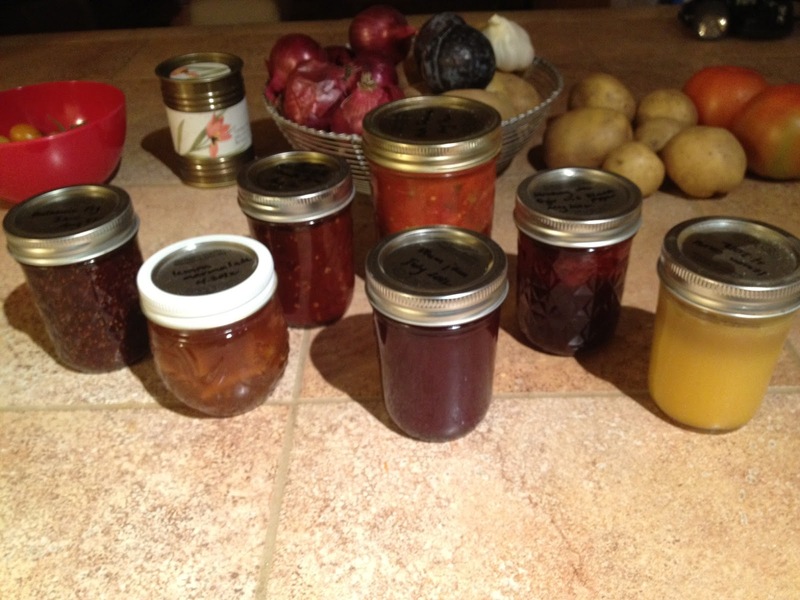 That book, Canning and Preserving, by Linda Ferrari, started it all. This year, due to all the jam making, I relied heavily on The Blue Chair Jam Cookbook, by Rachel Saunders. She has delicious and creative ideas and I look forward to further exploration of her giant citrus section this winter as our Meyer lemon tree looks to be producing a good crop. I'll end this post with the tomato jam recipe I love. It's soooo much better than ketchup on burgers! Using a vegetable peeler, remove the zest from the lemons in wide strips, leaving the bitter white pith behind. Squeeze the lemon juice through a strainer into a large, wide saucepan. Add the lemon zest, tomatoes, sugar, cumin, 4 teaspoons salt, the red pepper flakes, cinnamon sticks, cloves and ginger. Cook over medium-high heat, stirring occasionally, until the tomatoes are juicy and the sugar dissolves, 15 to 20 minutes. Continue to cook, stirring occasionally, until the tomatoes are dark and syrupy and a candy or deep-fry thermometer registers 220 degrees F, 40 to 50 minutes (the timing may vary depending on the juiciness of the tomatoes). Reduce the heat if the mixture starts to scorch. Discard the cinnamon sticks. Meanwhile, sterilize four 8-ounce canning jars and lids. Fill the jars with the tomato mixture, leaving 1/4 inch headspace, then seal and process. This post is a bit overdue and I have no particularly good excuse as for why, except that I have been canning a bit lately, but I will save those details for another post. As I have shared previously in this blog, we were fortunate to have many visitors this spring and summer. At the end of July we were pleasantly surprised to find that the parade of visitors from Minnesota was not over. Sean's friend and coworker Vasily and his wife Lily did a whirlwind tour of San Francisco, San Jose, and Yosemite over a long weekend. 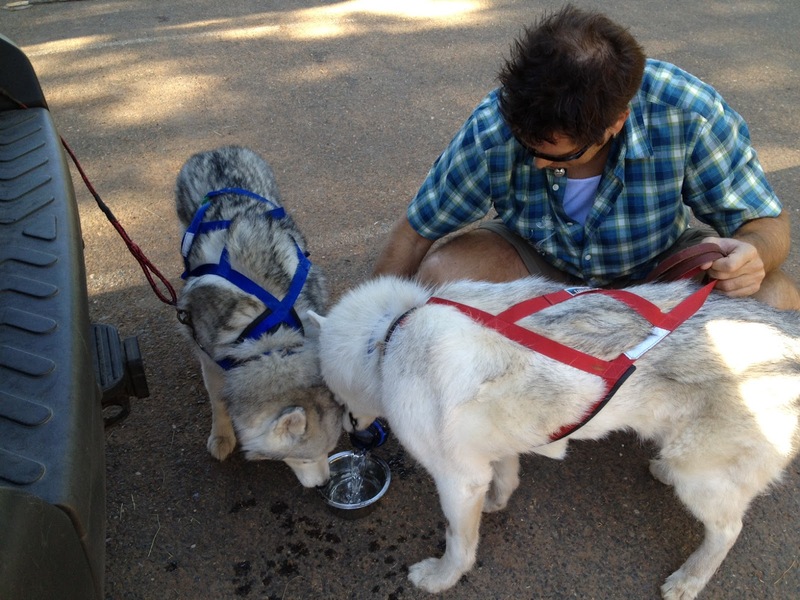 We were able to meet up with them for a day in the park. We began with breakfast at the Ahwahnee, did a tour of the valley, with a hike to the base of Bridalveil Falls, and a hike to Taft Point, which had been on Sean and my list for quite a while. The views were incredible! And the company was great. Sean and Vasily posing in front of El Capitan. Vasily had to show the St. Jude Medical folks what Sean's office looks like. Lily and Vasily at Tunnel View. The view from Taft Point is not quite as spectacular as the one from Glacier Point, but one is much closer to the scenery at Taft. 45 minutes by car up "The 99", as the highway is known in the Valley, lies Modesto, CA. Home of the Gallo wine empire (generous donors to UC Merced), hometown of George Lucas (celebrated each year with American Graffiti Days), and home base of Yosemite climber and outdoor clothing designer, Royal Robbins, Modesto is a town we visit often. Every six weeks or so I schedule a haircut at the Aveda salon in Modesto. I plan the appointments on Saturdays to coincide with the farmers' market. The Modesto Certified Farmers Market is a nice, mid-sized market with a variety of produce, cheese, fresh fish from Santa Cruz, and the best flavored olive oil, Sciabica. Because we buy so much, my guy sets me up with good deals and cheap shipping for my visitors. On our last visit to Modesto we also discovered a great organic grocery, Sunflower Market. Lately we have also enjoyed great meals at Modesto restaurants. We celebrated our friend Mike's tenure award at UC Merced with he and Laura at Camp 4 Wine Cafe, a terrific place for wine selection and delicious panini opened by Royal Robbins' son, who placed it in the original Royal Robbins clothing factory and named it after the climbers camp in Yosemite. Another favorite is Dewz where we celebrated our wedding anniversary. The table-side Caesar salad preparation wowed Sean and I was smitten by a delicious cocktail. Sugar N Spice contained: Ron Zacapa, Cherry Herring, Cinnamon Schnapps and Jalapeno, served with a Cinnamon, Sugar and Cayenne rim. It was liquid Big Red and it was fabulous. Merced has its charms, but Modesto has won us over for its produce we can't find in Merced and its great dining options. We have enjoyed many trips to Yosemite in the 14 months we have lived in Merced, but until June we had not yet experienced Yosemite's high country. My parents were able to join us to enjoy this amazing area. This trip is best documented in photographs. Thankfully we have my dad's to supplement our own pictures. This gorgeous shot gives a perspective on how breathtaking the high country is. Our tent (#16) at the Tuolumne Meadows tent cabins. A view from inside our cozy tent cabin. Our first hike was the Tuolumne Grove of Giant Sequoias. One of three groves in the park. Next stop - Olmsted Point, for the back view of Half Dome. A group shot at Olmsted Point. Soda Springs provided a short excursion into a historic piece of the Tuloumne Meadows area. Day two had us hiking up Lembert Dome. Can you spot Sean at the top? Dad, capturing Sean at the top. For a change of scenery we then hiked along the Dana Fork of the Tuolumne River. Day three led us to a wonderfully solitary hike around Tenaya Lake. A downed tree provided great seating for a break mid-hike. I opted for a spot on the sandy beach.